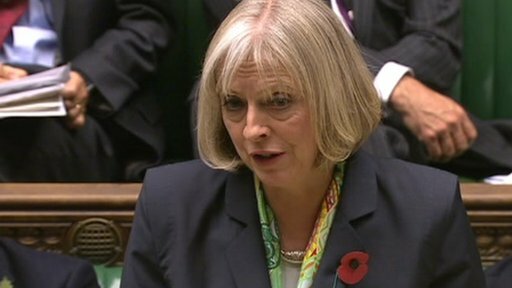 The director general of the National Crime Agency will review new allegations of child abuse linked to North Wales care homes in the 1970s and 1980s, Home Secretary Theresa May has said. In a Commons statement on 6 November 2012, Mrs May said Keith Bristow will investigate "renewed allegations against the police and several individuals". One of the victims of the abuse had recently alleged that a late-1990s public inquiry by Sir Ronald Waterhouse "did not look at abuse outside the care homes", she told MPs. The government plans to "ask a senior independent figure to lead an urgent investigation into whether the Waterhouse Inquiry was properly constituted and did its job", Mrs May said. Separately, Mr Bristow had been asked to "to review the historic police investigations and investigate any fresh allegations" by North Wales Police chief constable Mark Polin and was expected to report back by April, she added. "Child abuse is a hateful, abhorrent and disgusting crime, and we must not allow these allegations to go unanswered," she said. The home secretary urged "anybody who has information relating to these allegations to go to the police", pledging to ensure that victims who came forward with evidence would be properly supported. Shadow home secretary Yvette Cooper called for a single, overarching public inquiry to examine all the recent allegations of child abuse. "There are three BBC inquiries into what happened with Jimmy Savile, a Department of Health inquiry as well as several separate hospital inquiries, a CPS inquiry, a new North Wales inquiry and an HMIC inquiry into other forces who may have received allegations about Jimmy Savile," she pointed out. The Labour MP added: "We remain concerned that these multiple inquiries have no way to draw together the common themes, the problems, the lessons that need to be learned. "Of course we need to get to the bottom of what is happening in each case, but at the moment the framework the government has set out risks being very confused." Former Conservative children's minister Tim Loughton echoed Ms Cooper's call for "an over-reaching, robust public inquiry into the whole failings of child protection in various institutions throughout the latter part of the 20th Century". Mrs May said: "If, at the end of the processes that we've set in train, it appears that it is necessary to move forward to a wider investigation then we will look at that."